This post originally appeared on the http://www.deep-democracy.net/blog. Sera Thompson is a leading practitioner and senior trainer of the Deep Democracy method. She is the Founder and Director of New Leaf Social Innovation, a company that supports social innovation thru leading strategic initiatives, hosting engagement and training leadership. After graduating with a Bachelor’s degree in Geography and Environmental Sciences from McGill University, Sera’s career began as an environmental consultant. While she enjoyed much of this work, particularly learning from nature, it became clear that the work was not her ultimate calling. Ultimately her role felt like it was upholding the status quo of exploitive industries and she wanted to find a role that could help change the game. A highlight in that role was when she had the opportunity to support public information sessions for a proposed project, including the time spent discussing the community’s thoughts, concerns, and perspectives. This was an incredibly inspiring experience for Sera. At the same time she saw that more was possible as these events were little more than information sessions. She was eager to take part in more inclusive and effective engagement. 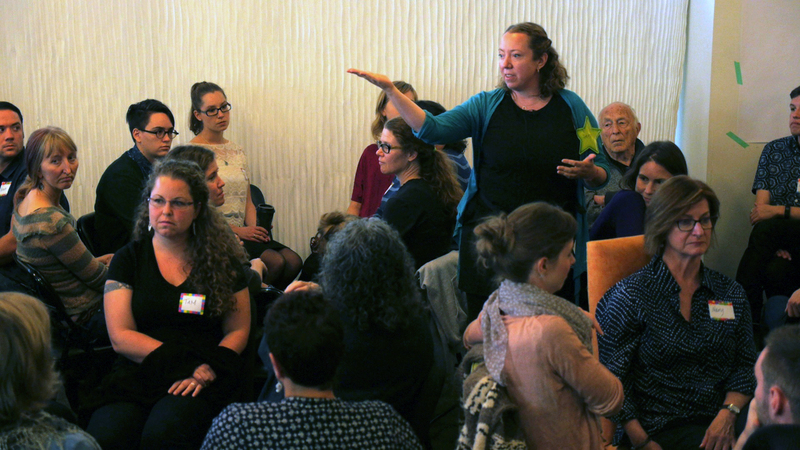 When first exposed to Art of Hosting and Deep Democracy methodologies, Sera saw the kind of facilitation and leadership that inspired her and seemed to align well with who she wanted to be in the world. From there her career in facilitation, mediation, and social innovation took off. I had the opportunity to ask Sera for some insights on the Deep Democracy method and examples of her practice. Walk me through a recent event where you used Deep Democracy. I was recently invited to lead a session with a team who needed to make a big decision about implementing a new program across a large organization. I started our meeting by introducing myself and inviting introductions from the team. I wanted to get to the ‘yes’s’ and ‘no’s’ right away so the check-in involved asking “what are your hopes and fears for this meeting?”- to which we received answers like “I hope that we crack this nut” and “I hope that we can all be comfortable and engaged”, and fears about how we might not be able to infiltrate the culture of government or “maybe there aren’t the right people in the room”. After the check-in I shared a bit about Deep Democracy, including some of the history, a quick piece around the concept of the iceburg, the belief that minority voices are where the wisdom is, and that there were two tools we might use- the ‘decision-makng’ and the ‘argument.’ I had the group brainstorm a big list of objectives for the meeting and then guided them to vote as many times as they wanted but with the caution that they should prioritize items that they felt were most important to cover within three hours. I took top three objectives and said- ‘ok now you only get one vote, so pick one that you feel is most important’. But very quickly things started cycling. I suggested we could do an argument, which started with checking for safety rules. The main safety rule that came out was “I don’t feel all that attached to this issue, so I want to sit out”. So half of the group watched and half got on two sides. Very quickly some big arrows got thrown. But while the issues were important for one side they weren’t a big deal for the other side. So it came down to a sense of – it was more of a communication issue than a fundamental conflict. So it was pretty quick and pretty light from there to get the main grains of what was important to them: really careful messaging, strategic implementation, how we do it is key, and we need good indicators and some clear objectives. I think this process was a bit frustrating for them because I was interjecting in order to prevent too much ‘radio-broadcasting’. I would say “who agrees with this? Who disagrees? Let’s see a show of hands to ratify that” to get us to clear statements. And despite this frustration, the sentiments expressed at the closing circle were very positive, with participants gushing about how well the meeting had balanced autonomy and dignity. People said it seemed like we were going quite slowly at first but were shocked in the end to see how far they got. Some facilitators like Peter Block say it is good to move from small groups of 3 or 4 to larger groups of 20 and back in order to harness both intimacy and accountability. Does your practice reflect similar methods in terms of group size? Myrna will say that if you’re going to use Deep Democracy you need ten percent of the group to have an understanding of the method. But a while ago, Aftab and I facilitated a town hall meeting with around 70 people using DD and it was very successful. We did a World Café-style session at first to surface main topics, then a ‘dotmocracy’ to narrow and then ran a soft shoe shuffle to work through the topic. One piece of caution around this is that is can be relatively volatile with a big group so it is a bit riskier in that sense. Another thing is about practicality- doing a soft shoe shuffle with a big group can make it hard to see everything that is going on. There may be an inner circle and outer circle and the facilitators can get caught up in that dynamic and miss the fact that there is a group of people who have disengaged. And then you need to think about how to sort out having a portion of the group that wants to work with the conversation and feels passionate and the rest that don’t want to be there. You have to have enough strong people facilitating to bring all voices (roles) into the conversation with each other. How do you intervene when that happens? It’s really context dependent. You could simply wrap up the activity. Or maybe you can ask people who are natural leaders and facilitators, but don’t have the Deep Democracy training to watch for outlying perspectives and people who are not getting heard. They can wave facilitators down to say “there is something over here that we are missing”. Are there some types of projects/meetings you will refuse to take? I have done a lot of public engagement and it’s really hard but also very rewarding. Recently I had a successful project working with the Greater Moncton Area on a sustainable transportation plan that went really well. We got a high turnout, and the City was thrilled with how it went. Shortly after, an engineering firm got in touch with me to work on a transportation-related public consultation. They were calling it public engagement but really it was an information-session. One of my criteria for taking on a process is that there is something the public can actually influence. It’s rare at this stage that the government gives over decision making power but there needs to be a question that decision makers are asking that the public can provide insight on, and not simply a session for them to receive information about a project. And I am up front about it with participants. I will say explicitly, ‘this is not your decision, the subcommittee is going to make a decision and wants to understand where you are at” and there needs to be real design questions that the civil servants or the architect want answered. Often, they really do want the public to love that building or project or service, so we shape the sessions to find what the users really want to see in the end product or what unmet needs they have that the project might fulfill. For example, I did a successful and fun public engagement around the implementation of roundabouts at a couple of major intersections in the Halifax, some of the public has been opposed to these in the past. At the meeting we created four areas in the room for people who primarily interact with the intersections as: pedestrians, cyclists, local residents, vehicle users (including transit). The cyclist group had tons of issues and ideas, which led them to have a follow up meeting, and then go back and forth with the City on the issue of roundabouts. They didn’t get all of their requests met, but I think they felt heard, and they received information on why they didn’t get certain things that they had wanted. Talk to me about some of the more challenging work you have done in the past year or two. I was a part of a project that involved both public servants and community-level practitioners working in “vulnerable” communities. I had brought in the people who were working in these communities but early on there was a breakdown of communication between our group and the team from the government. We had to do a lot of Deep Democracy work just to keep us together. So before we did the first engagement we talked through what the principles of it should be. We were cycling like mad but I just kept using the four steps over and over again. I would switch back and forth from clearly saying my view and then checking in with others. Over some time we slowly built principles. But we were challenged again by the issue of anger. The topic we were working with was a sensitive one and could bring up some anger, but there was a range of views around the appropriateness of getting angry. There was a view that people will get angry and that has to be ok. For others there was a sense that anger causes harm and it is not ok. So in the session as well we did principal building to decide if it is ok to get angry. We spent about 25 minutes on the question of “what do we do with anger?”, during which I was gaining all the views, checking for ‘no’s’, and we got to a place of: well we may get angry but if we are angry at someone in particular let’s do it one on one, not in the whole group- and if that’s too scary then ask someone to come with you to help hold the space. What do you see as the next steps in the development of Deep Democracy? Or do you think the facilitation field might go another route- will this remain more of a niche practice? What excites you about the future of this practice? So many of the issues we face as a society (demographic shifts, racial inequity, climate change, shrinking budgets, etc.) are truly complex and require fresh thinking and collective impact. The majority of of the current systems are mired in division and parochialism and “this vs. that” thinking. Deep Democracy has an incredibly strong contribution to make in shifting these things. But I can’t take it all on by myself and at the moment there is still limited buy-in to this approach. Maybe in three or four years there will be enough people with the skills and knowledge that we could talk about going beyond public engagement initiatives to bringing it into our actual democracy and how we make big decisions. Nova Scotia might be a great place to test some of that. Whether it will happen or not, who knows, but there is a possibility and I feel optimistic about it.